John Amico is a recognized name in salons throughout the United States. Amico, who personally formulates organic hair and skin products along with organic hair color, perms, Keratin and relaxers, has many lines that are used by some of the top names in the beauty industry. He brings the same passion he has used to create these products into his enterprise of Beauty Education. Amico has founded and owned three large chains with over 425 salons. Now after selling them to move forward in the industry, he is giving back to students and professionals by sharing his knowledge, acquired through a lifetime of experience. For over 50 years, John Amico has been educating students to enter a professional career in the Beauty Industry. Amico has provided thousands of graduates with state-of-the-art cosmetology educations and many have gone on to become very successful stylists and salon owners. Amico’s exclusive Main Campus in Oak Forest (a suburb of Chicago) and Spa Campus in Midlothian and offers Salon and Spa Services to clients as if they were in a salon. Student stylists, supervised by Amico’s handpicked professional educators, perform services with Amico’s highest quality cutting-edge products. John Amico Academy is also active in training students in salon business and ownership. Students always go on field trips to places such as: Amico’s 'Hair Performers' Salon, the Amico Beauty Showroom and Advanced Training Center directly across the street from our main campus and the John Amico corporate offices and distribution center located in the same community. Amico’s school is designed to have the feel of a real salon, so students have a sense of working in an authentic setting. The education is focused with the student in mind, so they are self-assured and salon-ready upon graduation. John Amico’s students don’t just complete Cosmetology State Board exams with confidence; they leave ready to start on successful, rewarding careers in an exciting, recession-proof, high growth industry. Salon owners consistently tell us that find our students are salon-ready for positions in their businesses. This is one of the many reasons why some of our graduates work in some of the finest high-end salons and spas, and quickly reach solid financial security. 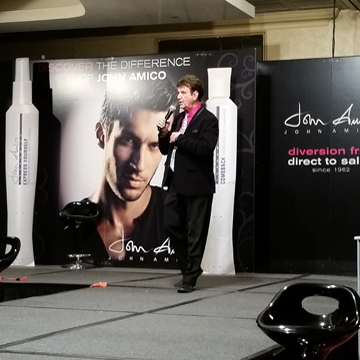 At John Amico, we host our own National Convention where hundreds of top stylists from around the world are invited. The Convention is close to our Campus so students are actively involved in all aspects of the classes and workshops. Each year, John Amico hosts the annual educational cruise where alumni and professional sail to the Caribbean for a 7 Day educational event. 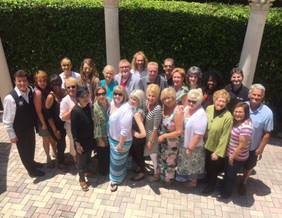 Top educators from the around the country go on the business, educational and fun-in-the-sun event. 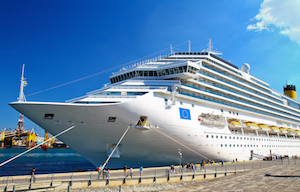 Sailing every year to different ports with the Princess Cruise lines and meeting different professional and experiencing 5 Star services, open the eyes and allow professionals to grow their business to a new level year after year. John Amico academies host student competitions all the time. We love to see the student reach for the stars with these creative competitions. This shows how ell the students is progressing and allows then to think out of the box. John Amico has gained national recognition in the professional cosmetology world f because of their high level of work and the beyond belief passion plus the level of integrity they possess. Very few students ever get the chance to meet the creator and founder of the one of the greatest hair color and product lines used by professionals through the US. John creative talents from winning styling and haircutting competitions spooned great exclusive Progressional haircutting system. This unique system allows students to be able to cut all types and styles of hair. In an in depth process John’s educators will teach you hands on to cutting. John Amico formulates your color right in the classroom and every student becomes versed in how the color shades are born and blended. John Amico’s vast network of professionals brings the very best to the students. International Guests Artists are regulars at the Schools National Convention such as Maria Antoinette from Rome, Eddy Burgos from Montreal, Jamie Carroll from Australia, Arturo Pratt from Spain, Rudy D’Amico from Italy, Yenz and Rienout from the Netherlands. These amazing artists inspire students to new height of education. Exposure to Great USA Stylists and Salon Owners. Networking among top stylists, viewing their work, interacting with them at John Amico and Industry events is very important. The John Amico School is a well respected educational facility in the beauty community affiliated with a network of Artists and Owners who want to be associated with the John Amico School and staff. John Amico is well respected as Top Artists and Salon Business Expert. Remember, if you want to become a top stylist you need to associate with the best stylists and educators. All schools can teach you how to do hair to make a living in the hair business. John Amico teaches you THE BUSINESS OF HAIR. Each week he holds a session for the entire school called “Who Want to Be a Millionaire.” His are real life discussion on how can you make more than a living but a fortune in the Business of Hair. More than just the best technical training your success will be based on your business and people skills. His real life “How to Tips”, is from the 50 plus years and having owned 425 Salons in his system. He teaches you systems to operate any part of the business. From salon site selection, lease negotiation, buying of equipment, hiring the staff, compensation schedules, advertising, marketing and on going training and business support. He will recommend what’s right for you when you graduate and always available to come in and discuss your business plan. Also John JR has a Masters in Business and will be happy to share with you advice on how to grow you business in beauty. Our School has the clientele for you to learn and earn a great education. WE have legacy clients who have been coming for as many as 50 years. We have alumni who have retired and now are even clients at the John Amico School. Our school has a prime location with hundreds for thousand cars passing every week. Unlike most schools we have a tremendous amount of weekly clients who want the newest and latest, not to mention some of old stand bys which give us the foundational styles. Men and woman are our clients such as cuts, styles, hair color, Keratin, braids, extensions and even creating full sew ins. Come in a see the amazing creations our student do on our loyal clients. John Amico is always on the cutting edge of trends and is incorporating the newest and the latest. The John Amico educators pride themselves in working directly with each student. Unlike a large change or multi unite school, John Amico in on had at the schools many time days on end. He works with his educators and discusses your progress and giving advice on how to maximize your talent and potential. Unlike many schools you are not charged for any of your personal services. Hair color, relaxers, cuts, bleaching…your name the services is all complementary for his students. WHY since the other schools charge students? Because John Amico wants you to have a complete educational what is more complete than you getting your hair done all the time to look good. He is not worry about the money but about your education. So, when you Look Good, You Feel Good and your build more Self Esteem and Self Confidence in beauty. John Amico Professional Products are used by thousand and thousands of professional in some of them most upscale salons. Your will receive collections for your personal home use. Also every service that you do John Amico will supply you with the products. We partner with the top companies in product and color systems. This includes – P&G Professional, Wella Professionals for color and styling products, and Professional Sebastian. You’ll start out working with and learning how to sell dynamic product lines that will increase your future sales. Our Cosmetology kit contains high quality professional equipment, featuring Imported Shears, blow-dryer and flat-iron, brushes combs and clips. Kit items subject to change at any time in order to keep current with industry trends and technology. In 2014 our students had a 98% licensing rate in the State of Illinois far exceeding the general applying student from other schools. The historical rate posted monthly by Continental Testing is between 18 to 20% of the students from other schools are failing. However at John Amico we are proud of our student’s record of success. We have one of if not the highest records of successful students passing the boards and getting their license. The Best Salons want the best graduating students who can do haircutting, highlighting, hair coloring, keratin treatments, hairstyling and chemical texturizing. Like other industries, they want students who are comfortable, social, networked, and highly-skilled. Being associated as an alumni or current graduate affords you a network of thousands of salons that rely on the John Amico School for its graduates and the John Amico Products. However, you need to prepare to get that dream job it is all up to you.